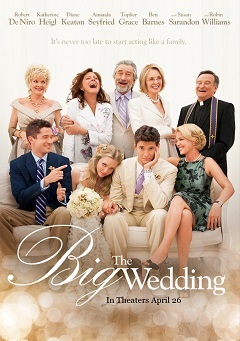 Coming soon the comedy movie “The Big Wedding” will be released. The movie’s director “Justin Zackham” says it will be release on April 26, 2013. Basically it is an uproarious romantic comedy films that presented by “Millennium Films” studio. The films main story discuss about a charmingly modern family who trying to survive a weekend wedding celebration. In this story, Don & Ellie Griffin is long divorce couple and there are adult children. In this movie Griffins are hysterically enforced face up to their past, present and future and with a bit of luck keep away from killing each other in the process. Main Character; Don, Ellie Griffin, Lyla, Alejandro, Bebe McBride, Monighan etc. Starring; Robert De Nire, Diane Keaton, Katherine Heigl, Barnes, Susan Sarandon etc.